By Kristen Lomasney on May 31, 2016 at 7:08 p.m.
You guys asked for it, so here it is: A transcript of Adam Savage's annual talk at the Bay Area Maker Faire festival. 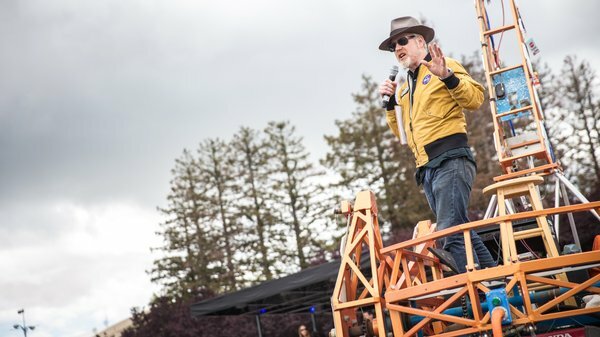 This year, Adam spoke from a mechanical giraffe (naturally), sharing stories about his recent visits to maker spaces around the country, his bouts of self-doubt, and his mission going forward. I'm really sorry I wasn't here last year. I apologize. I was in another state, and I mean an actual state, not a state of mind. Last December, Jamie and I took our road show on the road, as you do. We took our stage show — called "Adam and Jamie Unleashed: Behind The Myths Tour" — and we took it to 31 cities in 36 days. We've been doing this for five years. It's a show we love to perform. We do it for 2,000 or 3,000 people at a time, and it's really wonderful. We wrote it, we own it, we love it. I'm up on stage in New Orleans for the opening night, and it's late November. We've just wrapped MythBusters two days before, and we've flown to New Orleans. We're doing this show, we get up on stage, we do the whole show, and it's fantastic. It's going really great. The crowd is wild, the food was great, and I get to the closing monologue of the show, and I turn to Jamie, and I'm about to deliver the closing monologue and I realize it's not in my head. It's totally not there. 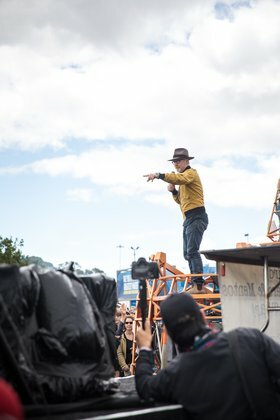 I've done enough stage performance to know that one second for the audience feels like about 15 seconds to me, so I know not to start panicking about the time, so I start scrolling through what I remember from the show, because I've remembered it all up until this point, and there's nothing there. All the file cards I have for the end of the show are blank. I just started talking. I started talking about how grateful we were to be there, and I said something that tickled in my mind, where I was supposed to go in order to tee up Jamie's monologue, and so I did. Jamie gives me a look of naked panic, because this was not what he was expecting. I gave him the first line of his monologue, and then we were cool. Then we finished the show. I'm going to work from notes here. A couple weeks ago, I did a really wonderful AMA on Reddit/Maker. I think some of you were probably on then. We did it in conjunction with The White House Office of Science and Technology, and a trip I'd taken to Cleveland. I got some fantastic questions on Reddit, but this really struck me: Four separate people asked me, "Do you ever get despondent? Do you ever get discouraged, and how do you deal with that?" It is a really common question. Interestingly enough, that question came up during a really, really crappy week I was having in my shop. When I say crappy, I mean superiorly crappy. I did the AMA on a Wednesday. On Monday, Norm, Joey and I had started a one-day build in my shop; I was going to build some dials and some stuff for Apollo suit that I'm working on with Ryan Nagata. This is precision work. I have recently gotten a Bridgeport Mill, and I was doing some milling operations along with the lathe, and it's been a while. When you're milling stuff, order of operations is everything. I wasn't getting them right, and everything I built was screwing up, and usually at the very end, on the last operation. I had to build everything three times, and the third one was just barely good enough to send to Ryan to mold and cast for the parts we were making together. I literally finished the day, I'm not kidding, thinking this thought, "I have no business making things." My God, there is a Power Loader from Alien over there. That's really cool. The view from up here is awesome. I can see everything from my giraffe. The fact is, is that we all feel it, every maker in the world feels this despondency, this discouragement and that's actually part of the process. The failure doesn't just go away. Most of you know my history. I started working in commercial special effects and in theater in San Francisco in the '90s, then I got to Industrial Light and Magic and spent five years up there. There was not a single build I was doing on Star Wars, on AI, on Space Cowboys, where somewhere within the project, I didn't hit a roadblock that was so severe, I thought someone was surely going to come and tap me on the shoulder and tell me to go home because I have no business being there. Every single project and this still happens. I came to talk about making today in a wider frame. What is making? It is a term for an old thing, it is a new term for an old thing. Let me be really clear, making is not simply 3D printing, Art Lino, Raspberry Pi, LEDs, robots, laser and vinyl cutters. It's not simply carpentry and welding and sculpting and duct tape and drones. Making is also writing and dance and filmmaking and singing and photography and cosplay. Every single time you make something from you that didn't exist in the world, you are making. Making is important; it's empowering. It is invigorating, but why? There are lots of results that are good that come from making. We improve the world around us. We show people how much we care about them. We solve problems, both personal and societal. These are outside results, they're great, but the secret sauce being embedded here at Maker Faire is that it's good for kids. We all know this, but why? Why is making good for kids? I started making when I made buildings out of paper. It was a series called the World at Your Feet by Alan Rose and you can build all of the international landmarks from the Taj Mahal to the Chrysler Building out of paper. This wasn't die cut paper. You have to cut it out with an X-Acto blade and carefully score it and glue it together. It took hours and hours and hours. It deeply informed my understanding of how planar forms meet. Sometime around the age of I think 13 or 14, I grabbed a bunch of cardboard and I made a man that sat in front of my house and freaked my neighbors out for weeks. In the process of making that man, I just had this idea, "Oh, I want to make a man." I started putting it together and I started taping it together and I started painting it and I seriously had this moment where, somewhere around 70% on the way into the project, I went to my mom and I said, I just want to memorialize that at this very moment, I am perfectly happy. What I was feeling was the empowerment that comes from the fact that I was using my hands to create something that didn't exist before. Yet, what I got out of it was different than what I set out to make. This is the thing, nothing ever goes according to plan. A great general said, "No plan survives first contact with implementation." 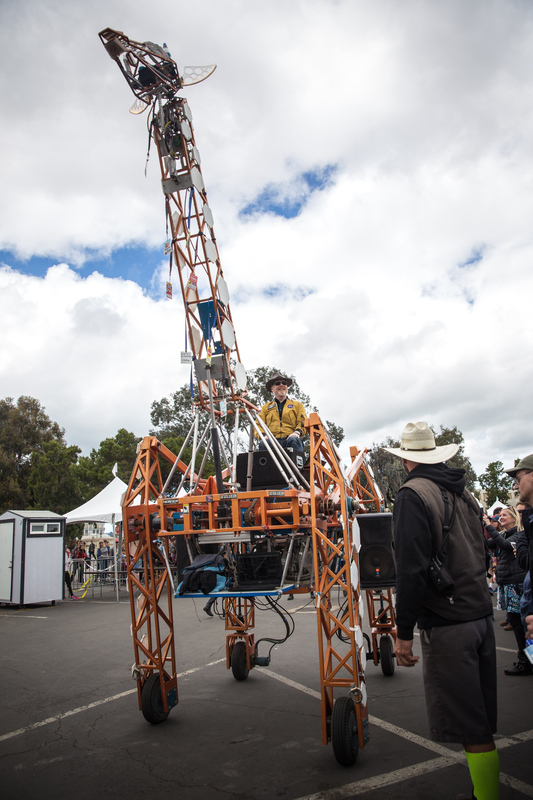 As a crowd full of makers, you know that you set out to make something. You set out to build something and what you end up with is never quite exactly what you set out to make and if it's really good, it's so much better than what you expected. It's smarter than you, it's cooler than you thought you could make something and it informs you and it teaches you. As you live with it over the years, it gets better and it gets different because you're different. That's not a bug, that's a feature, that is part of the plan. Nothing ever built is precisely what the builder intended. Diane Arbus said, "None of my photos are what I see when I'm taking the picture. They are all either better or worse." Kurt Vonnegut says, "Travel plans gone astray are nothing but dancing lessons from God." Picasso said, "Art is not an aesthetic operation. It's a form of magic designed as a mediator between this strange hostile world and us." The world is a cool place and we are insignificant. Sorry, kids, totally true. Life will be full of strife, hurt, disappointment and failure. As a parent, and the parents here know this, one of our jobs as a parent is to both protect our children from this knowledge until they can properly process it and deal with it. We have to protect them and prepare them at the same time. Making things and being a creator is the ritual by which we experience that in microcosm. Making is how we teach kids to find the path, not to design the path but to find the path that's happening. We've all gotten to the point in the build where you realized things aren't going the way you thought they would go. You realized a radical new direction is necessary. Again, that's not a bug, that's a feature. It's how we learn. It's how we learn to deal with life. The joke about Carnegie Hall: how you get to Carnegie Hall is practice, practice, practice. Failure requires practice too. We have to practice to fail better. Einstein said, "Success is nothing but failing without lowering your enthusiasm." How does bringing making to kids fit within the educational landscape? I am not an educator. Teachers have a really, really difficult job and my hat is off to them. I had some amazing ones and I find the idea of facing a room full of children and keeping them interested terrifying. When we decry teaching to the test, we mean the rote memorization of facts. Facts are great but facts without context are just noise. They don't make us better citizens or better stewards of our culture. Every single person here has probably had a great teacher — someone who showed them something they didn't expect. I want you to right now think about that teacher, remember them. Why do we remember them? Why were they important? I submit that what they did was, they were able to take the facts of the world and put them in a context for you. They put them in a story for you, one that made sense of the world at that moment. Good teachers turn facts into a story. When we have a system where teachers aren't given the resources or the space or the support to help kids understand the context of facts, we're not educating, and what is it about story? See, this is the thing. I have this long talk, I'm writing in my head, for years and I won't get to it for a while yet but I think storytelling is the origin of everything that is human. I think that our sentience makes us natural storytellers and that we invented language around the campfire in order to tell better stories, even if the story is, "Hey, this arrowhead kills the bigger thing faster so we can eat longer. Everything you make is a story about you. As one of the very limited number of sentient beings in this tiny section of our galaxy, our culture thrives best when we are all contributing our stories. It has never been a better time to be a maker. 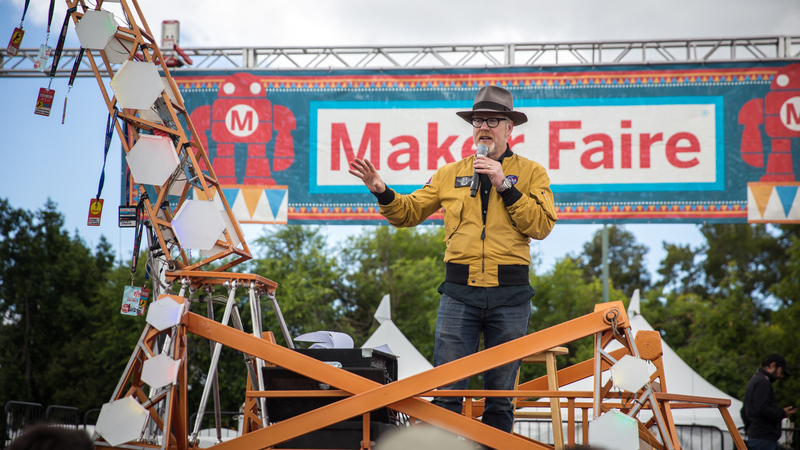 We all totally agree with that, out here with thousands of Maker Fairers and hundreds of thousands of people being exposed to 3D printing and vinyl cutting and welding and machine is ... I mean, all of this stuff, it's so beautiful to watch what kids can do. This is also why I think it's never been a better time to be a maker because the increases in computing power and the economies of scale have turned computers into what cars were to the United States in postwar culture. Post World War II, you had a whole bunch of people who were solely in the middle class, well educated because of the GI bill. They had some disposable income and they started realizing that cars weren't black boxes. They were these platforms that you could improve and improvise with and do stuff with. That is where computers are right now and we've got like 9-year-old girls making a Sensor Arduino Robots. That's magnificent. Yes, but — and this is really important — the opportunities for making are not evenly distributed right now. If we were going to progress as a people, as a species, as a culture, we need to heal the things that divide us. I don't think anyone disagrees with that. The things that divide us socially, economically, racially. 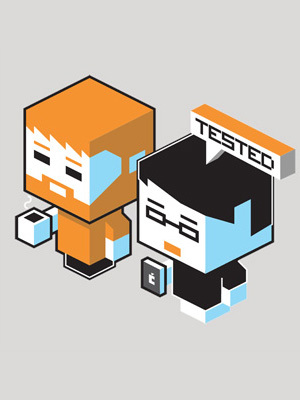 One of the great things about right now being a maker is the Obama administration. They believe strongly in this. This is the first White House to have a Maker Faire in the White House. I'm standing on a giraffe that went to the White House. Amazingly, somehow, this thing got frisked by the Secret Service and allowed to enter the White House. How do you frisk a giraffe? "Sir, are you comfortable with me touching the inside of your robot leg?" On behalf of the White House Office of Science and Technology and the White House Director of Making, Andrew Coy, a few weeks ago, I went to Cleveland which is a city looking powerfully at ways to heal the divides within that city. Again, racially, economically, socially. Cleveland was one of the cities in the United States hardest hit by the economic downturn. Whole neighborhoods absolutely razed by the housing crash. We went to Boys and Girls Clubs and saw maker spaces in those. The public libraries. 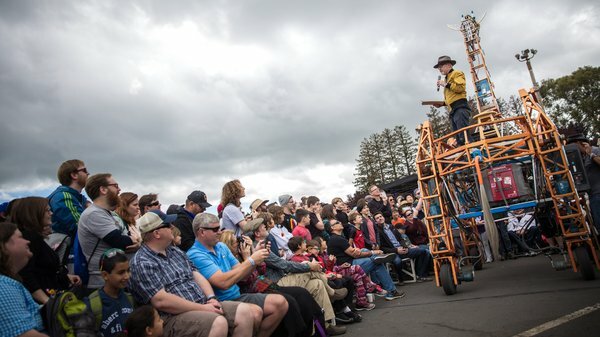 These groups are leading the charge to bring making to every kid because when a kid realizes that they can reach out and alter something, make it a little bit better, they've made their sphere a little better but really because of what happens in the mental process, they've actually made the world a little bit better. This is my mission. We need to make sure that the threshold for making is as low as possible for absolutely everyone. This is how we empower all the members of the next generation, to make the world in their image.